Ohh. Activision dredged up the good name of Sierra a few days ago, and nobody was clear on why. As it turns out, Sierra is going to be the mega-publisher’s esoteric indie label, distinguished by an arm’s length from the Activision name shareholders don’t want to see attached to anything that isn’t CoD, Skylanders or WoW. First to rise from the crypt of the necro-publisher is a new entry in Sierra’s best-known adventure game series, King’s Quest. 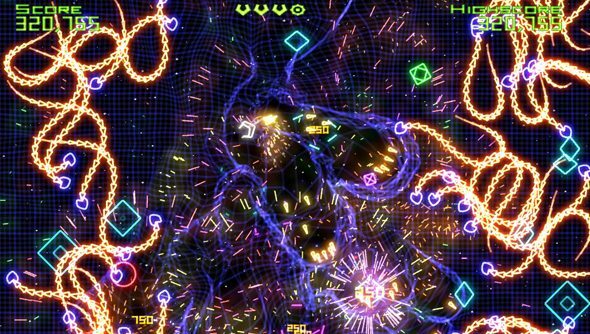 And a second sequel to a game that was never part of the Sierra stable: Geometry Wars. Activision plan to hand dusty Sierra licenses to “gifted, up-and-coming” indie developers, and publish the results under the new label. The new King’s Quest comes from The Odd Gentlemen, whose Misadventures of PB Winterbottom you’ll remember on Steam and in Humble Bundles over the past half decade. King’s Quest’s been “reimagined”, but hopes to recombine the tricksy puzzles and regal storytelling of the original series. It’ll come out next year on Steam. Geometry Wars 3: Dimensions will be out by Christmas, and is the work of Liverpool’s Lucid Games. You won’t know them, but you’ll know their history at Bizarre Creations – where Geometry Wars was first developed as a Project Gotham minigame. On the one hand, it’s not going to be Sierra as it once was – it’ll be broader than that. On the other, who on Earth expected Activision to be doing this? I’ll take a slew of new games over a closed drawer full of decaying licenses. How about you?